​This Streptavidin-Eu cryptate is used in the HTRF® Kinase Binding format, in combination with an N-terminal-biotinylated Kinase and red-fluorescent tracers. 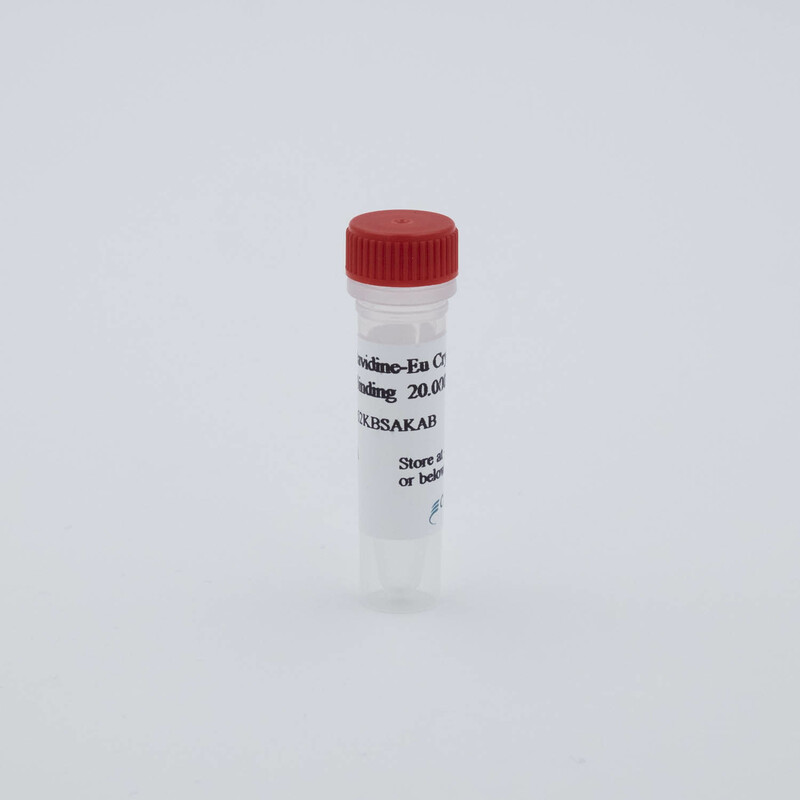 ​The binding of the tracers is detected in a sandwich assay format using Streptavidin labeled with Europium Cryptate (donor), which binds to the N-terminal biotinylated-Kinase, and a red fluorescent tracer labelled with d2 (acceptor). The detection principle is based on HTRF® technology. The HTRF ratio (665/620) will increase upon the addition of more of the tracer, and will saturate depending on the dissociation constant (Kd) of the tracer to the N-terminal biotinylated-Kinase. Saturation binding experiments on the three tracers (i.e. Staurosporine-Red, Dasatinib-Red, and Sunitinib-Red) can be run in 96- or 384-well plates (20 µL final volume). First, a dilution series of tracer ranging between 0 and 1 µM in the Kinase Binding Buffer is prepared in a 96-well non-binding plate. NExt, 5 µL of Kinase Binding Buffer are dispensed into the final 96- or 384-well plate. Then 5 µL of N-terminal biotinylated-Kinase are added, followed by 5 µL of Streptavidin Eu-cryptate. Finally 5 µL of the red tracer solution are added. The HTRF ratio is measured after 1 H of incubation. Principle of HTRF® Kinase binding assay (IC50/Ki-determination). The binding of the tracers is detected in a sandwich assay format using Streptavidin labeled with Europium Cryptate (donor), which binds to the tagged Kinase, and a red fluorescent tracer labelled with d2 (acceptor). The detection principle is based on HTRF® technology. The HTRF ratio (665/620) will increase upon the addition of more of the tracer, and will saturate depending on the dissociation constant (Kd ) of the tracer to the tagged kinase. When an inhibitor of the kinase is added, the tracer will be displaced and the HTRF signal will disappear, depending on the dose. ​Pharmacological evaluation of inhibitors of interest can be run in 96- or 384-well plates. First, a dilution series of inhibitor ranging between 40 µM and 0.23 nM is prepared, and 5 µL of each concentration are dispensed into the plate. Next, 5 µL of tagged-Kinase are added, followed by 5 µL of Streptavidin Eu-cryptate. Finally, 5 µL of tracer solution are added, prepared at 4x the final concentration. The HTRF ratio is measured after 1H of incubation. Analyses of the data give typical dose response curves ranging between 10 µM and 56 pM, enabling an evaluation of the IC50/Ki values for the inhibitor of interest. ​D​ose response curves of various known kinase inhibitors (Staurosporine, Dasatinib, PP2, Imatinib, Tozasertib, Sunitinib, Gefitinib, and Sorafenib) were measured using Sunitinib-Red at its Kd (22 nM) on 5 nM KIT-BTN. Dasatinib and Sunitinib showed high potencies, in good correlation with literature values. As expected, Gefitinib does not bind to KIT. Stauroporine-Red is used in HTRF Kinase Binding assays. Dasatinib-Red is used in HTRF Kinase Binding assays. Sunitinib-Red is used in HTRF Kinase Binding assays. The Kinase GST binding Discovery kit is intended for fluorescent inhibitor selection. 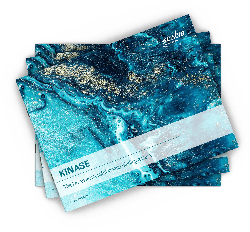 Kinase binding Discovery kit is intended for fluorescent inhibitor selection. 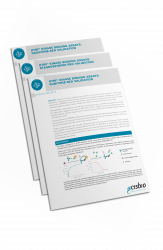 MAb Anti GST-Eu cryptate is used in HTRF Kinase Binding assays. MAb Anti 6HIS-Eu cryptate is used in HTRF Kinase Binding assays.